interrupt the quiet of a sunny autumn afternoon. The shouts are announcement, also greeting for the community health workers making their way up hills of the coastal villages along the Eastern Cape’s Wild Coast. Of late there’s been newfound respect and appreciation for these local caregivers, the so-called nomakhayas, who are part of the healthcare arm of the Bulungula Incubator (BI), the not for profit that has started several community development projects in the region for the past almost 15 years. Over the last few weeks this brigade of 19 women has been instrumental in eradicating a stubborn scourge of scabies that’s left few homesteads untouched, and resulted in at least one reported death of a child in the area. The success and tenacity of this brigade of CHWs has been a powerful reminder of how effective implementation of primary healthcare comes down to strong community networks, collaboration and commitment. At the height of the scabies outbreak old and young were left were affected with the extremely itchy pimples left from the burrowing mites. In extreme cases scabies can affect the proper functioning of the kidneys (Pic: Bulungula Incubator). Scabies is a skin condition caused by a burrowing mite (undetectable to the human eye) that lays its eggs under the skin. It leaves its human hosts with an intense itchy rash and a trail of tiny pimples. While the skin condition is easily treatable with common topical creams and preparations, the problem with the outbreak in these four villages – where there isn’t access to running water – was that re-infection happened faster than eradication could be achieved. The local clinics and hospitals could only hand out medication, but were at a loss on how to eradicate scabies completely. When scratched sores become infected they can turn septic and pose bigger health risks. 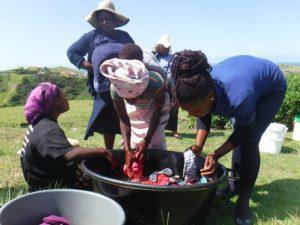 Bongezwa Sontundu, health programme manager at the Bulungula Incubator, remembers how by the beginning of the year the scabies outbreak had taken over the four villages of Mgojweni, Nqileni, Tshezi and Folokwe that is home to about 6 500 people. Photos she and health programme assistant Khunjulwa Mbi have of the worst cases they saw, reveal the extent of the outbreak. Both young and old people were affected and some people scratched till the blistered sores became raw, infected and painful. Dr Ben Gaunt, clinical manager of the Zithulele Hospital, about 35 minutes from the Bulungula Incubator says the scabies outbreak in the region had started to rear its head in 2016. Then it just spread. For about the last nearly two years it has been endless frustration for medical staff. “It’s a relatively simple condition to treat and it’s not life-threatening, but when it goes wrong and sores become infected it can lead to a reaction that causes problems with the kidneys. “We saw an increased number of cases of kidney problems especially in children,” says Gaunt, confirming the death of at least one child linked to complications arising from a scabies infection. The eradication programme the BI carers undertook involved carrying out an intensive and systematic cleaning regime. Sontundu explains that they first needed clear discussions for buy-in from the community. Then a team of five carers arrived at an earmarked homestead where the occupants would have cauldrons of boiling water on the go in time for the nomakhayas’ arrival on the appointed day. Clothes, linen, curtains and towels were boiled in the water while bedding and mats were taken out of the huts to be aired and sunned. Items that could not be washed were placed into closed black plastic bags for three days to ensure any mites or mite eggs would be suffocated. the programme and on the third day a fourth household would be tackled. Also on the fourth day the team would return to the first household to start the medical treatment of the occupants of the home. All the occupants had to follow the same chemical treatment regime at the same time. The treatment that’s applied topically had to be repeated after 24-hours and again on the fifth day of the eradication programme. Sontundu says following these quite strict guidelines required the oversight and implementation of the nomakhayas. It had to be meticulous to ensure the mites, in whatever phase of their breeding cycle, could be killed at the same time. “You can imagine if we asked people to do this all work without the help of four or five carers – they wouldn’t do it,” she says. It was the co-ordinated and structured efforts of the nomakhayas that finally halted the cycle of reinfection of “ukhwekhwe”, the Xhosa term for scabies. For Gaunt it’s been a relief. He says: “We have seen an across the board decline of scabies cases. The efforts by the nomakhayas show that they are one of two arms to efficient rural health care – nurses being the other. “When CHWs are supervised and supported they have hugely positive impacts on the communities,” says Gaunt. Some months after the intervention programme the BI carers are doing usual rounds at the home of Gogo Nophamethe Mdoseni and the six other people who live in the homestead. Mdoseni’s usual day includes looking after her two-year old grandson Akahlulwa, grinding dried corn at the rondavel on a hill that has a view stretching beyond the crashing waves of the Indian Ocean. Outside her rondavel her blankets, mattresses and mats are spread out on a sloping hill catching the rays of the midday sun. Other items are draped over the igoqo, the stockpile of wooden sticks that become a makeshift washing line. “The people know now what they can do themselves to keep the scabies from coming back,” says Mbi, as Mdoseni invites the carers into her home for a mug of sweetened mageu and sweet potatoes straight from the coal fire she’s been stoking outside her hut. “When the nomakhayas came here and said they were going to start cleaning I just let them do it, but I didn’t think it would change anything because the scabies had been a problem for many months already,” says Mdoseni in Xhosa. “Then after a few days we all stopped itching and everyone was scratching less and I was very happy that it worked,” says Mdoseni. She lifts up Akahlulwa’s shirt, there are still a faint line of scars from the scabies pimples that he scratched uncontrollably months before. She breaks into a big smile and so do the nomakhayas. The carers eat the sweet potatoes; they smile a little but don’t dwell on taking too much credit for just having done their jobs. Before they leave, they bring out their scales and their exercise books, making notes about ailments and checking the general condition of the members of the household – it’s their usual routine. Sontundu says the BI carers have since they started in 2011 served as an early warning health system in the community. They receive basic first aid training and health and hygiene training. They’re equipped to monitor health problems and being part of the community they understand the things that can affect a family here – everything from domestic violence, depression, alcohol abuse and food insecurity. “Things are working well here now,” says Sontundu. At a monthly meeting day at the newly built Bulungula College, the latest in a line of projects spearheaded by the incubator, the carers meet to report back to Mbi. One of the newest recruits is Boniswa Mahlaleni. “People I haven’t met before are sometimes scared of me. 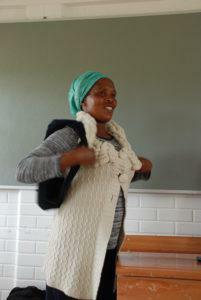 They think that we nomakhaya are like a health police, nagging at them to take their medicines,” she says in Xhosa. 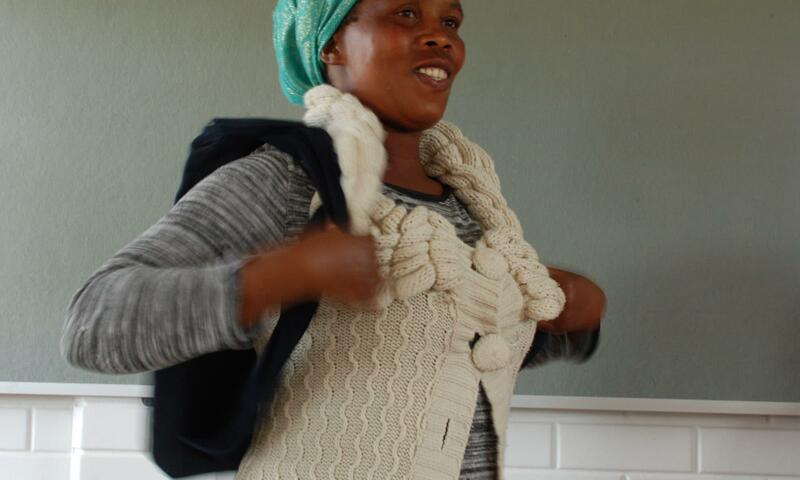 But over the six months she’s been with the programme Mahlaleni’s learnt that patience and persistence pays. She’ll keep donning her navy blue clothes, the signature colour of the carers, keep packing in her patient files and her scale to weigh patients and she’ll keep climbing the hills, knocking on doors or waiting for the local children to announce her arrival. It makes a difference, she knows, it can even save a life.